The Bell-Horn Spine Brace Flex Power Plus is constructed of ergo-dynamic panels and spine brace that comfortably contour and conform to each patient's body structure. Has a low-friction mechanical advantage pulley system with a quick, one-hand adjustment providing controlled compression and support level. Comfortable. Mesmorizing. Effective. Easy To Use. Stabilizes. Exercising. Daily Use. Extra Support. Following Surgery. This brace is fantastic I'm back to my self again! Exercising. Daily Use. Extra Support. 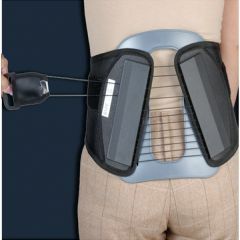 I have been suffering from lumbar and leg pain for years. I slipped on the ice in 2001, and was rear ended in 2008. I was in constant pain every day. I have had 4 lumbar injections within the last 8 months. I decided to go to our local home medical and buy a brace just to see if it would help. I noticed after wearing it day after day from morning to night that my back stopped aching, but when I would sit in my recliner for hours knitting or crocheting it wasn't helping my back. So I decided to search online and see if I could find something with more stability. I came across this brace and ordered one. I can now sit, and crochet, knit for hours without my lower back and legs aching. I will definitely buy another one of these before it wears out. Well worth the money, I just wish I would have ordered a smaller size. I went by waist size, but I wear this around my hip bones and I had to tie knots in the strings so it was tighter.